By Sean McDaniel: Adam Booth, the trainer/manager for David Haye, says they have no interest whatsoever in facing recently beat Dereck Chisora (15-3, 9 KO’s). They want one of the Klitschko brothers next otherwise Haye will stay in retirement permanently. What Booth is referring to is the fight that took place between Haye and Chisora at the Vitali-Chisora post fight press conference in Munich, Germany. It started with Haye showing up at the post fight press conference and asking Vitali why he wouldn’t fight him. He was rebuffed by Klitschko manager Bernd Boente, who said they were no longer interested in fighting him. Boente then suggested that Haye fight Chisora. 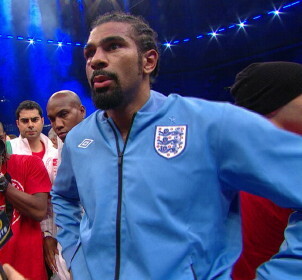 Haye said wasn’t interested in fighting anyone with “three consecutive losses” like Chisora. That angered Chisora, who got up, took off his jacket and walked up to Haye to dare him to say that to his face. Haye immediately punched Chisora rather than waiting to see what he would do. Haye may have been worried about being sucker punched or slapped by him the way that Vitali was slapped without warning the day before. When things settled down, Chisora repeatedly said he wanted to shoot Haye. At that time, Haye made a quick exit to get far away from Chisora. A lot of boxing fans are now interested in seeing Haye and Chisora mix it up in the ring. However, Haye isn’t one of them, still only wanting the Klitschko brothers and not someone who has lost three out of his last four bouts like Chisora. To be honest, it’s probably not even a doable fight right now because Chisora could lose his boxing license to fight in the UK if the British Boxing Board of Control takes it away for Chisora’s actions during and before the press conference.